The design by Gensler, with concept design by Hollwich Kushner, aims to create inspirational, collaborative, and healthy workspaces in the eight-story building, which includes 500,000 rentable square feet (rsf). 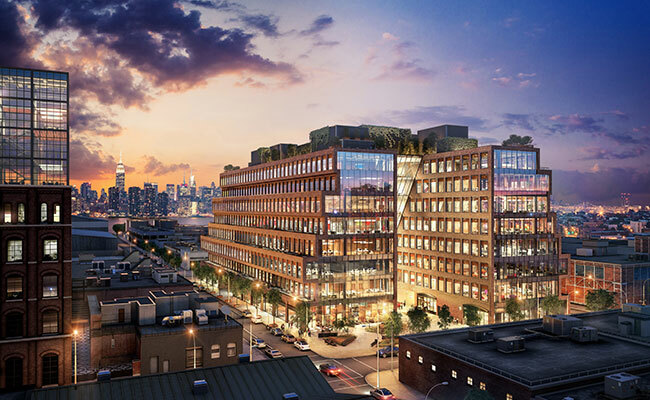 The office building is integrated into the surrounding community and incorporates state-of-the-art technology that addresses the needs of tech companies, helping to attract an innovative workforce to Brooklyn. Tetra Tech focused on creating comfortable, sustainable, and productive spaces designed to have a high level of wireless connectivity and accommodate large electrical loads to support future companies, ultimately making this a competitive building in a former industrial zone. The building, which is targeted for LEED Gold certification, sits on a redeveloped site that had been contaminated by years of industrial use and now features open and landscaped spaces for public enjoyment, centrally located within a network of mass transit and community services. Tetra Tech consulted on the use of sustainably extracted and regionally manufactured products and minimized light pollution. Our team designed high-efficiency building systems and designed maximum thermal and lighting controllability for tenants. Tetra Tech’s lighting design minimizes light pollution through fixture selection and timeclock schedules and enables maximum adjustability for tenants. Because the building is located in a flood zone, the electrical vaults had to be located on the roof of the building, rather than in the street to ensure resiliency and reliability for the future tenants. Tetra Tech also designed sustainable building systems that include cooling towers; floor-by-floor air handling units; high-efficiency, gas-fired hot water boilers; hot water fin tube perimeter heating; and high-performance plumbing fixtures that provide a 35 percent reduction in potable water use. These systems allow the flexibility to have several different businesses within one building while providing maximum occupant comfort. Tech tenants have substantial requirements for power, data, and cooling, so the Tetra Tech-designed MEP and IT systems allow for significant future expansion to satisfy these tenants. Our team designed the building’s telecommunications systems to have the maximum physical redundancy for wire-line internet service providers entering the building. The system has entry points on both the north and south sides of the building, uses diverse risers within the building to provide back-up internet service, and allocates space for a distributed antenna system (DAS) to ensure ample cellular coverage. Having redundant systems prevents tenants from losing coverage, providing a reliable work environment that is essential for companies today. This resulted in the building receiving a WiredScore Platinum Certification. This project is the result of a collaborative design effort to produce a building that is attractive to innovative tenants. The project is currently under construction and is expected to open in 2018.